Rogue Valley Sewer Services (RVSS) holds the Municipal Separate Storm Sewer System (MS4) permit from the Oregon Department of Environmental Quality for the cities of Central Point, Phoenix, Talent, and urbanized, unincorporated Jackson County. The MS4 permit program is run by RVSS’ Stormwater Program Coordinator, Jennie Morgan, and involves Public Education, Public Involvement, Construction Site Stormwater Controls, Illicit Discharge Detection and Elimination, Post-Construction Stormwater Controls and Pollution Prevention in Municipal Operations. 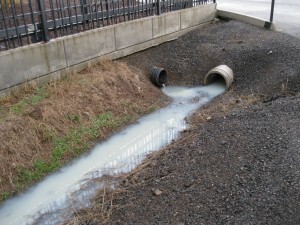 The stormwater systems in the Rogue Valley flow directly into creeks and rivers without treatment, thus any pollution that enters the stormwater system will end up in the creeks and rivers. Consequently, the goal of the MS4 permit program is to ensure that only rain goes down the drain. RVSS maintains a Spill Hotline that the public can use to report spills to the stormwater system. Dial 541-779-4144 and state that you want to report a spill to the stormwater system. For questions or comments on RVSS’ Stormwater Program contact Jennie Morgan, 541-664-6300 or jmorgan@rvss.us.